Editor’s Note: This work is the second publication of Urantia Press, the imprint label of Urantia Foundation. We are pleased to announce that it will be available soon. John Zebedee conceived the last of the four Gospels some 70 years after he last saw his Lord and Master in the flesh. Seeing that much had been omitted from the previous records, he sponsored what was to be the first untold story of Jesus. His work preserved important and even seminal events and teachings that would have been otherwise lost. 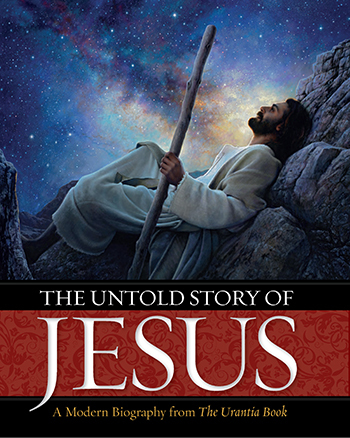 In that spirit we felt it fitting that John’s last words should be the first words of this new secondary work from the Jesus papers: "The Untold Story of Jesus: A Modern Biography from The Urantia Book". This tale began 11 years ago as Mo and Jennifer Siegel began commissioning renowned Christian artists to paint scenes from the midwayer narrative. Their vision was to bring to life stories and settings lost to the world until these days of the fifth epochal revelation. Acquisitions continued over the next nine years until the collection numbered over 40 paintings. Work also began on a book to showcase the works along with corresponding stories from the papers. The goal was to make this modern biography of Jesus accessible to God-seeking souls the world over. Arduous editing produced a manuscript of well under a quarter of Part IV with a working title of “Great Jesus Stories.” To further refine it, we assembled an editing team representing over three centuries of combined study of the papers: MaryJo Garascia, Jim English, David Kantor, Stuart Kerr, Lucretia Schanfarber. Whether this speaks to a great scholarly storehouse or merely old editors is left up to the reader. • A master document to preserve a replete record of the editing process. • A manuscript organized into 12 chapters based on the arc of major phases in the Master’s life. • Literary devices such as sidebars and chapter openings to paraphrase and condense text. • Front and back matter. • Classic art and licensed paintings for familiar stories and teachings. As time came to produce the book, we hired a world-class independent publishing team that produced many of Scholastic and National Geographic’s finest books. The team consisted of a designer, production manager, editor, proofreader, art archivist, indexer, and cartographer. Over the next year we designed a book that would do justice to the art as well as to this enthralling narrative of Jesus we all know and love. It was to be small enough to fit in a backpack, have the readability of a hardcover novel, and incorporate luxury features, all rolled into a polished design. Yet another review of the art netted improvements and a few more commissions, giving us 106 paintings. The greatest challenge was to effectively arrange art and stories into a cohesive whole. Graphic motifs were established for form and function. Elements like pull quotes, sidebars, and illustrated boxes add visual interest and are essential for effective page layout. We commissioned three maps, including a two-page spread charting the Master’s three years of travels. An exhaustive index was the final touch. It is interesting to note that these publishing professionals exhibited a sincere respect for the manuscript, both as a literary work and as spiritual truth. Whether they believed the Jesus papers or not we do not know, but it was always treated with gravitas. As a secondary work, this book now follows the Urantia papers as the latest feature of the progressive evolution of human society. It took the brilliant writing of the midwayer commission, 35 artists, and thousands of hours of work from 29 contributors to make it happen. We have received advance copies and heard positive reviews from spiritually seeking people. It is a perfect gateway book for family and friends who are spiritually hungry but not ready for The Urantia Book. It will be available in early May. Click here to pre-order the book at Amazon. In the meantime, we invite you to preview the book here (Look Inside - PDF), here and here. The pages in this book are rife with passages declaring the world ripe for a revival of the true religion of Jesus. Though the dissemination of the revelation itself has been staid and measured, we can shout Jesus from the rooftops.